accessibility barriers in their daily lives. I am writing to ask your help in gathering real testimonies. The project will be made stronger through the voices of real people, with various disabilities, who can share their experiences. The testimonies need only be one to two paragraphs, can include a picture or not, and can be submitted with a real name or anonymously. We would also love to share on our site any video which you think would be appropriate – of personal testimony, or of civil rights issues in general for persons with disabilities. 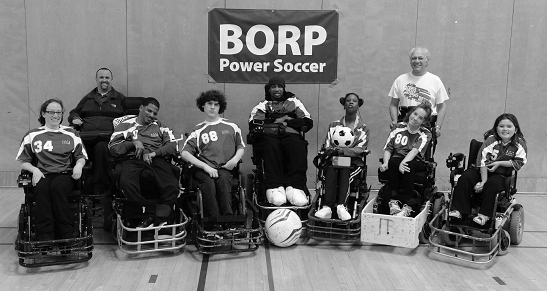 BORP’s Power Soccer Program invites you to come out and cheer for the BORP Bay Earthquakes, BORP Crushers and BORP Bombers as they charge into the New Year with games against teams from San Jose, Hollister, Fresno and Newark. Admission is free. This just added: Final game (approx: 5:30) on Saturday will feature local Team USA players, including BORP’s Kendra Scalia-Carrow, playing against a team of Bay Area All Stars. Team USA is coached by BORP Head Coach Chris Finn and is preparing to defend its World Cup title in November 2011 in Paris. Games will be played at James Kenney Recreation Center, 1720 8th Str., Berkeley. Photograph courtesy of Scot Goodman. Between the November and December Training Camps, Sam lifted heavy weights, with 330 pounds being his heaviest. After the December camp he reduced the maximum weight to around 200lbs and added swimming to his routine. He concentrated on stretching and speed and agility in his throwing practice. With his coach joining him in San Diego two days into the December camp, Sam needed to maneuver his field chair with his suitcase (balanced on the forks he had mounted on the front of his chair) from Baggage, up and over the sky bridge and down to the waiting Olympic Training Center van. During this camp he continued to improve his ability to keep up with the team’s grueling schedule. He now sets multiple alarms on his watch so he doesn’t lose track of time in the morning and reports to breakfast and his events on time. 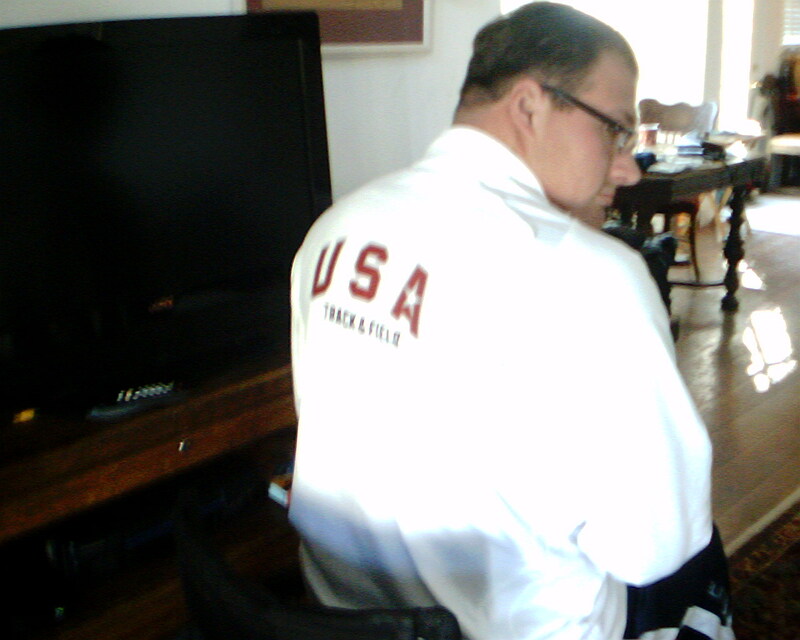 Sam returned from the December camp with more official clothing and instructions to wear only Nike or plain shirts and shorts when training as they are the official sponsors of the US Paralympics. He also received an official team backpack, wheelchair bag and duffel, all bearing the winged “USA” and “USA Track and Field” logos. 1) Know your travel details—when the plane departs and arrives, how you will get to the hotel, what hotel you are staying at, how you are travelling to the venue to compete. 2) Know the meet schedule—what day and time will you compete— what type of a schedule is it (rolling or time established). Write up your personal schedule when you need to leave the hotel, how long of warm-up you will need, when you need to check in with the clerk of the course, where the clerk of the course’s table is and how far the warm-up area is from the track. If there is not a warm-up area that fits your needs, be sure to find a location the day prior, if possible where you can properly warm-up. It is always better to be there 40 minutes early and scope out everything than be 20 minutes late and be in a panic or miss your event. 3) What should be in your backpack?– That depends on your classification and events. EVERYBODY – Credential — Water and/or Powerade, Snack (Fruit, PowerBar, granola bar), a small towel, extra safety pins, toilet paper (small little packet of T.P. ), a small plastic bag to keep gear dry if it’s raining, have a list of all medications (correctly spelled) that you are taking—just in case you are drug tested, sunscreen, a sweatshirt or rain jacket and a little cash. A watch that is on meet time. Wheelchair athletes put your names on the hub of your wheel and on your chair—it makes it easier for others to put chairs together correctly. Throwers- Tools to tighten chairs, duct tape, white tape, have your name on your chair, one implement that you know has weighed-in, gloves if you use them, stakes, straps and hammer (depends on competition). 4) Testing the facility—Arrive early enough to check out the surfaces that you will be competing on– is the track soft, the ring slick, or the board flat—so you can prepare mentally for your competition. Check out the blocks prior to getting in them—see if the same type are in the warm-up area and make sure you know how they adjust. Know where the medical staff will be located. 5) Know the rules of your event—Have a copy of the rules for your event in your bag. 6) Lay-out your uniform and bag the night before—make sure you have your uniform, socks, shoes and everything you will need the next day. Inspect all your equipment. If you have your competition number, put it on your uniform the night before. Remember to put your credential in your bag. Check your bag each night before a competition to make sure you have everything. If you’re missing something, you have time to try to replace it, rather than trying to find it when you are at the track. The plane leaves at 10:30 this evening and arrives Saturday. The flight is 14 hours and crosses the International Date Line. On such a long flight, everyone has been instructed to stretch and move their legs often during the flight. The FIPFA bid document was reviewed by the International Paralympic Committee Governing Board at its meeting in Guangzhou, China at the start of the Asian Paralympic Games. There were many strong points to the bid, but apparently not enough to push through Powerchair Football as the first electric wheelchair Paralympic Sport. Several thousand athletes with severe and multiple impairments who use an electric wheelchair for their daily living take part in this team sport around the world. The Crushers and newly reconstituted Bombers faced off on Saturday December 11 in two hotly contested matches. The Bombers recently absorbed several of the HardDrivers and the comingled group had its first games together, bravely taking on a much more seasoned and cohesive Crushers team. The Crushers started with the ball and threatened in the early minutes of the game. But gutsy play by veteran keeper Sebastian Klopfer and defensive powerhouse Emile Perry held the Crushers scoreless for the first quarter of play. The Bombers were unable to stop Talia Galibter as she raced down the pitch to sneak one past the defense for the first goal of the game. Luis Campos came in to relieve Klopfer and April Bryant managed to thread the ball between defenders to score with just under six minutes left in the half. Brian Larson tangled it up with keeper Campos, pushing the ball through for the final score in the half. In the second half John Starks won a battle with the keeper to score the fourth goal by the Crushers and Ian Kinmont shot down the court to put in the Crushers fifth goal. With just 3:17 left in the match John Starks blasted another shot in off a corner for a final 6-0 game. Tyrone Cobb and Perry teamed up with Milo Balcziunes in the second half and the Bombers threatened several times but were unable to get one past the Crushers’ keepers. Happy Holidays! Youth Program Review and More. I want to take a minute to say Happy Holidays to everyone. The year went by waaaayyy too fast and we are already looking into 2011. Last year, we tried to increase our programs to include Sled Hockey, and launched our Jr. Adventure program to provide more non-competitive activities and events. Altogether, we provided 124 opportunities for you all to take part in. That does not include the drop-in Cycling opportunities that were available to you at the Adaptive Cycling Center. 2011 is going to be just as amazing, if not better. 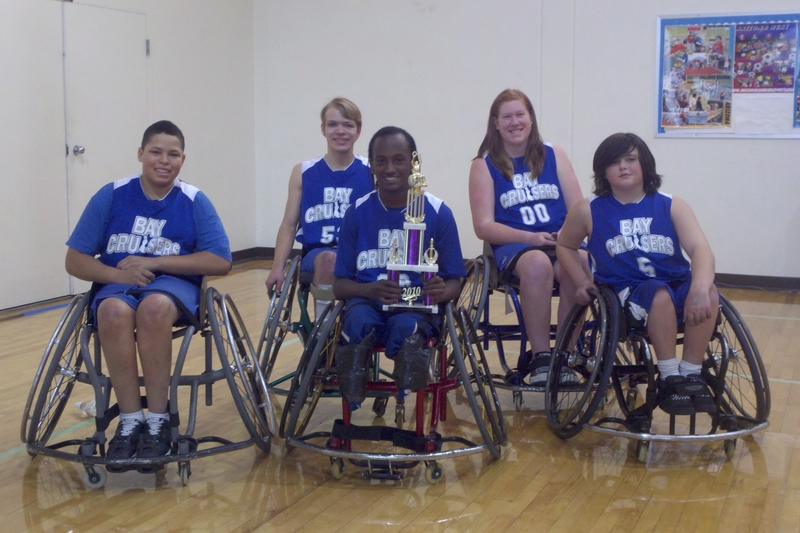 Our wheelchair basketball program is thriving. The Prep team will be defending the National Championship they won last season. The Varsity team is on the verge of making their way back to the National Tournament and will be trying to qualify over the next couple of months. The Recreational basketball program continues to grow and new kids are always dropping in. Sled Hockey is going to continue to grow thanks to the support of the Oakland Ice Center, the Always Dream Foundation, the National Hockey League Players Association, and the Firefighters efforts to support the program with the Guns ‘n’ Hoses Hockey Game. We will continue to grow and develop the Sled Hockey program with the intent on having the same successes on the ice that we have seen on the basketball court. Our Jr. Adventure Program is growing. In 2010 our activities included scuba diving, camping, Alcatraz, baseball games (both A’s and Giants), rock climbing, kayaking and more. In 2011 we are going to step it up even more. We are starting the year off with Snow Skiing on Jan. 22, and are planning another trip to the snow in March. We will continue to provide activities including scuba diving, rock climbing, kayaking, water skiing, rafting and more. We are going to offer a Jr. Adventure Camp this summer to give you all an assortment of activities packed together in one action packed week. In April, we will be having an end of the season Banquet to celebrate the kids success. This summer we will be having our Summer Energy Challenge again from June – August where we track the activities that the kids do within BORP’s programs. We will again be trying to hit the 250,000 calorie mark. Last year the kids pushed their chairs and rode bikes over 1600 miles and burned over 239,000 calories. This year we will again be doing our now famous truck-pull. This year we will be moving the location and the kids will need to earn the right to pull the truck. So, get ready. 2011 is going to be amazing. Please make sure that if there is another kid in your school that has a physical disability, you tell them about BORP and get them out to take part in our programs. I hope you all have a great New Year and I will see you all soon!